Wooden Captain Kidd's Adventure Galley Model Pirate Ship 20"
Royal Louis Wooden Tall Ship Model 24"
Wooden Ben Franklins Black Prince Black Sails Pirate Ship Model 20"
Wooden Ben Franklins Black Prince Black Sails Limited Model Pirate Ship 26"
Wooden HMS Surprise Master and Commander Model Ship 24"
Wooden John Halseys Charles White Sails Limited Model Pirate Ship 26"
Wooden Charles Darwins HMS Beagle Tall Model Ship 20"
Wooden Mayflower Tall Model Ship 7"
Wooden HMS Endeavour Tall Model Ship 20"
Wooden HMS Victory Limited Tall Ship Model 15"
Take to the high seas and sail with notorious pirate Captain Kidd in this fabulous model of his legendary flagship the Adventure Galley. 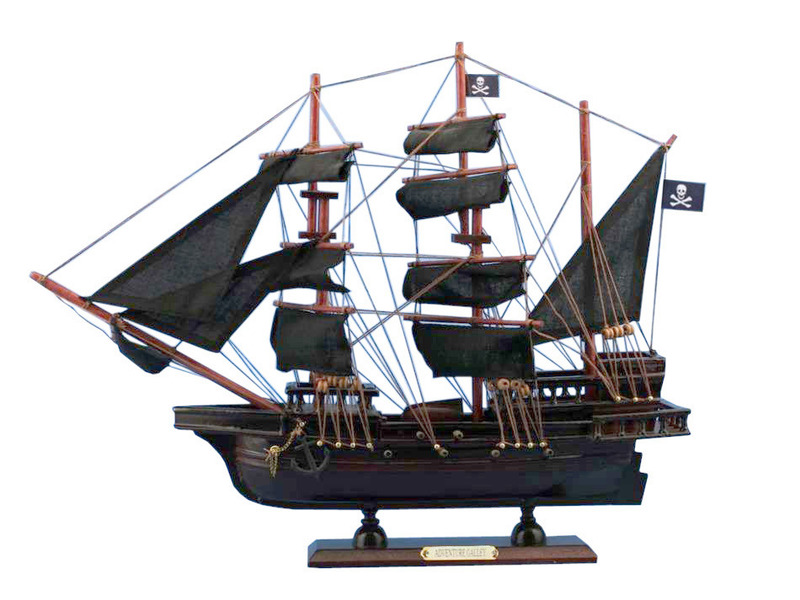 These masterfully crafted pirate ship models liven up any room of the home or office, and add a distinct nautical flare and touch of adventerous spirit to any room’s décor. Constructed in England in 1695, the Adventure Galley was called “the first ship ever built by the British to hunt pirates.” Weighing in at 285 tons, with a compliment of approximately 32 cannons, she was a ship complete with full sails, though she was also outfitted with oars. While a seemingly strange design, this gave the Adventure Galley added mobility when winds died down or when in close proximity to pirate ships. Unfortunately, the ship was crafted with seemingly low quality wood, had thin planks, and no metal coating, leading her to an inglorious end off the coast of Madagascar. The same year the Adventure Galley was built, Captain William Kidd set sail from New York to England in search of a Royal Commission as a privateer. Granted letters of marque by the King William III of England, Captain Kidd worked out a venture with English noblemen as investors. With eighty percent of the initial costs paid by the Earl of Orford, The Baron of Romney, The Duke of Shrewsbury, and Sir John Somers, percentages were worked out for returns in bounty captured. There are many discrepancies on the amounts of percentages, with some accounts stating that Captain Kidd in fact promised 60% of the bounty to the crew, 60% to the Lords, and %60 percent to the crown; while it may never be known what the actual rates were, the deal was made and Captain Kidd rendezvoused with the Adventure Galley. In April of 1696 Captain Kidd sailed the Adventure Galley out of London, though with only about half of the crew necessary to properly operate the ship. Due to King William’s War, or the Nine Years’ War in North America, there was shortage of sailors in the Navy which lead the Royal Navy to declare the Captain Kidd would only be allowed 70 sailors, only half of which were experienced at sea. At a disadvantage on the outset, Kidd sailed to New York to bolster his crew. Whether by offering high wages, or because of a lack of available work in the area, Kidd was able to recruit a suitable crew in New York and continue his mission. Sailing out onto the Atlantic, the Adventure Galley traveled Southwest, following the winds and eventually reaching the South Atlantic. By mid-December of that year the Adventure Galley found itself in thick fog in the South Atlantic; as the fog cleared Kidd found his ship in the midst of Royal Navy squadron that had been severely hindered by scurvy and dysentery. 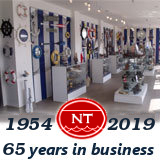 By law the Royal Navy was allowed to impress up to half of Kidd’s crew into service aboard their navy vessels, and knowing this, Kidd quietly ordered his crew to row the Adventure Galley away that night. Though he escaped with crew and ship intact, the episode would come back to haunt him as the Commander of the British fleet declared that Kidd’s actions seemed suspicious and that he may, in fact, be a pirate. Continuing on to the Indian Ocean, the Adventure Galley rounded the Cape of Good Hope and made way for Madagascar to effect repairs. Landing in January of 1697, the Adventure Galley was repaired as best as possible, the crew rehabilitated, and Captain Kidd set out yet again. With the ship continuing to leak badly, by this time forcing the crew to pump water daily, Kidd’s mission began to turn from that of catching pirates to that of merely staying afloat and alive. After being devastated by dysentery, with 30 of his crew lost, Kidd was forced to careen the Adventure Galley yet again, this time stopping at the Island of Mohilla. While the ship was being repaired Kidd was able to round up replacements for his crew, though on this tiny island many he found were hardened and seasoned pirates. It was around this time that the Captain William Kidd may have turned from pirate hunter to pirate. With a ship that was in bad repair, and a crew that needed to be paid and fed, Kidd sailed through the Indian Ocean eventually attacking a small British ship before capturing a Portuguese ship. Though he only took supplies and directions from the English ship the act was still one of piracy, and as England was not at war with Portugal at the time Kidd had committed an international act of piracy. Now in search of a prize that would keep himself and his crew afloat, Kidd pushed for the Red Sea, hoping to take one of the large Indian merchant ships heading to Mecca. As the Adventure Galley sailed along the coast of India, Kidd was soon to come in contact with the Quedah Merchant. Rounding the tip of India in January of 1698, the Quedah Merchant was a large cargo ship containing silk, muslin, sugar, opium, and saltpeter; all prized and exceedingly valuable merchandise. Two months after entering the Red Sea, the Quedah Merchant and Adventure Galley crossed paths, Captain Kidd’s crew emerging victorious. Kidd flew French colors aboard his ship to surprise the crew of the Quedah, and after a brief attack the ship was seized and renamed the Adventure Prize. With a new ship, of higher quality, Kidd returned along the coast of Africa, eventually stripping and burning the Adventure Galley along Île Sainte-Marie, off the coast of Madagascar. While the Adventure Galley ended her brief life here, Kidd continued on to be charged with piracy, hanged, and eventually becoming a legend – though many wonder – was he in fact a pirate, or a privateer whom history has misunderstood?